The sharp new look matching the Black and Copper theme of the AP amplifiers is only the beginning. The hardware inside is where the magic begins. A quick fact: You can only be as good as your source material, and the DSP-Z8 IV II series greatly expands your potential for the best possible source material. The Toslink optical input accepts the digital signal from your head unit or from a portable HD player, but the IV II series doesn’t stop there. The DSP-Z8 IV II units also have digital Bluetooth streaming so you can stream digital music. Speaking of hardware, we have added the ADSP-Z8 IV-8 this year. 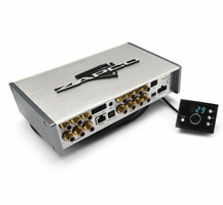 So you can have the DSP Z8 IV II with an on-board 8-Channel full range Class D Amplifier. You can only be as good as your source material, and the DSP-Z8 IV II series greatly expands your potential for the best possible source material. The Toslink optical input accepts the digital signal from your head unit or from a portable HD player, but the IV II series doesn’t stop there. The DSP-Z8 IV II units also have digital Bluetooth streaming so you can stream digital music. An interactive digital port will expand your options even more. The port accepts the control input from the included Dash Remote so you can change input source, change memory presets, control the master volume and even control the output of your system’s bass amps. 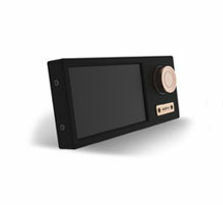 But beyond that, this special port will let you upgrade to the 3” digital touch screen remote for more control (available September 2018). And in November 2018 you will even be able to connect an external HD player, with its own integrated remote. Also available in November 2018, is the iPhone interface that will let you play up to 192kHz HD music files direct from the iPhone’s digital output. New features, new control... even improved sound quality. Of course it’s the software that lets you get the results you want from all that hardware and we made some major improvements there in both control and features. First, you will now be able to control the Series IV II DSP with your PC or with your iOS or Android smartphone or tablet. Even given the size restrictions inherent in mobile devices the you can completely set up your system with Zapco’s mobile app, however the best way is with the single page PC GUI. 1 - The input choices now include Bluetooth for streaming digital music. 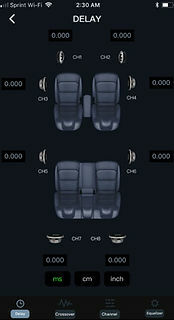 2 - The input map lets you choose which input will be used for each output. The system will make default choices for you based on your choice of input source, but can be overridden as needed for your system. 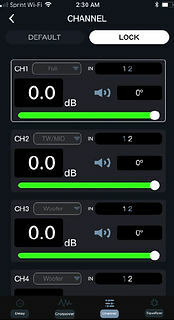 4 - Drop-down menus for each of the 8 output channels allow you to identify each speaker by its function. When you do that, the system will apply default crossovers, so your speakers are always protected. 5 - Linking buttons let you link channels, so you can adjust them together for crossover, delay, and gain level. Simply pick a channel then click another channel to link them together. When finished you can click any channel again and the link is broken. 6 - We expanded the crossover type to include Linkwitz-Riley, Butterworth, and Bessel, and the slopes can range from 6dB/octave to 48dB/octave. 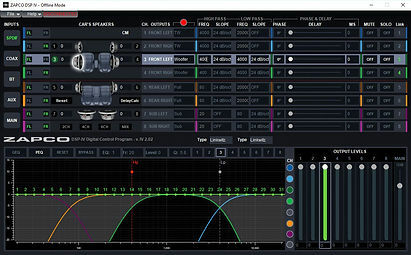 7 - EQ link bar allows you to link channels together for equalization. You can link them to adjust them together, then unlink them for minor changes to one channel, then re-link them and they will maintain their relative differences. 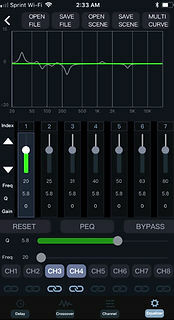 8 - The EQ bar tells you everything you need to know while you are tuning. The band you‘re using, the frequency, the level and the Q are all on display here and you can switch between GEQ and PEQ, you can temporarily bypass the EQ or you can reset the channel completely. 9 - It’s easy to get ahead of yourself when tuning 8 channels with 31 bands each, so the shaded the graph portion and left highlighted only the frequencies in the channel you are working on. This will help keep you focused on the frequencies available for each channel. Speaking of hardware, we have added the ADSP-Z8 IV-8 this year. 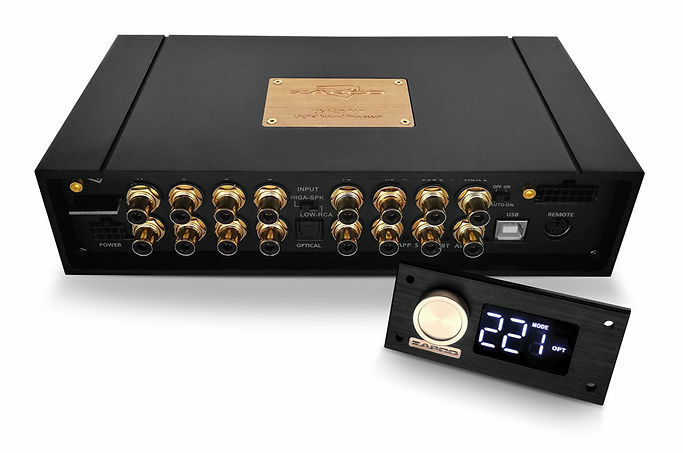 So you can have the DSP-Z8 IV II with an on-board 8-Channel fullrange Class D Amplifier. As good looking as this product is, it's not just a pretty face. 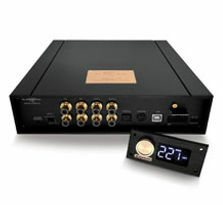 This amplifier give you 80 Watts per channel @ 4 Ohms and 120 Watts per channel @ 2 Ohms. Zapco was the very first company to give you a full function DSP on-board with in a car audio amplifier. 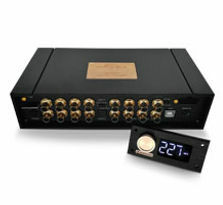 That was in 2004, and it was the Class AB, Reference DC (Digital Control) Series. Those amplifiers and were immediately lauded for they're Zapco sound quality and the amazing versatility provided by the digital processor. But as AB amplifiers they were also quite large at a time when cars were becoming smaller and lighter. With the advances in Class D technology over the last 15 years we have been able to get that same Zapco sound quality into the new Z8 IV-8 in a smaller and more powerfull package. Compared to the multichannel Reference DC amp, the Z8 IV-8 will give you almost 40% more power and do it in less than 1/3 the size. With high power, graet Zapco sound quality and Z8 IV II DSP, we believe the Zapco ADSP-Z8 IV II-8 will be the dream amplifier for many audiophiles and tuners alike, and the amp of choice for anyone who wants the best of everything in a very small package. 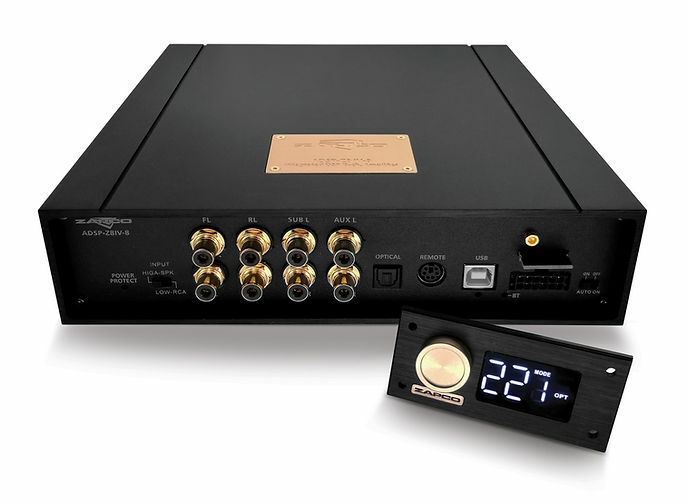 PS: The touch screen remote, the HD Player, the 196kHz iOS HD input, and all other upgrasdes coming for the Z8 IV II processor will absolutely apply to this amplifier as well. The Zapco DSP-Z8IV II apps for Android and iOS are identical and allow you to setup and tune your system with your smart phone or tablet.The goal here was to have a control system that made sense in a smaller platform but would allow the user to do everything necessary for a complete setup and tine. When you open the ZIV II APP your smart device will sync to the settings that are in the active preset in your DSP, so you will always open the app to the settings you are listening to. From the Channel Page, you can assign the function of each speaker, choose which input channel the speaker will have, Check the Phase for polarity, and adjust the individual channel gains. When you set the speaker functions in the Channels page the system will assign default crossovers to protect your valuable speakers from frequencies that can be dangerous to them. You can customize the crossovers to fit the needs of your individual system. The Delay Page lets you enter centimeters or Inches and immediately give you the applicable Delay in milliseconds for a rock solid and accurate front stage. 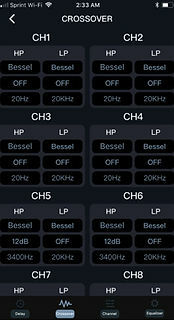 The EQ page holds the heart and the brains of the App. You can use either the Graphic or the paragraphic EQ’s. The EQ bands slide to reveal all 31 bands. You have adjustments for Gain, frequency, and Q factor. You can work on channels individually or you can link them into pairs with the link icons. At the top of the page you can save a setup-and-tune to the DSP, and you can also save it to a file on your phone or tablet. 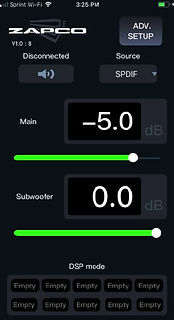 You can also choose to load a preset from the DSP or from a file on your phone or tablet. 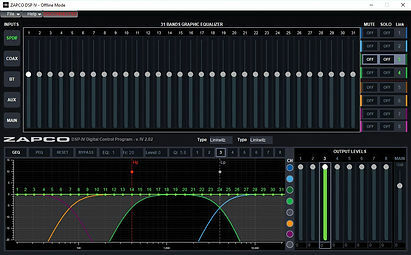 The graph shows how your adjustment are affecting the signal going to the amp and you can choose to have just the active channel show on the graph or have more show, with the drop-down menu.